I found this game at an estate sale. I had spent the whole day at the house picking old boxes of D&D and other nerd stuff and found this board game. When I asked the man for a price, he told me I could have it. Between this game and the 35 boxes of stuff I bought from that house, it was the best treasure find of the year. 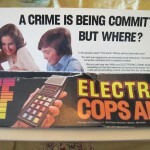 The game requires the use of the Electronic Crime Scanner to play. 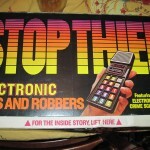 The scanner is the tracking device that allows you to find the thief, win bounties, and ultimately win the game. St: The thief runs along the street, or the thief rides on the Subway then returns to the street. Note: The thief doesn’t always move when you press the “C” button. If the crime scanner only beeps, it means the thief stayed in the same place. The “T” button is a tip button that can only be pressed when you draw a specific Sleuth Card. The tip button/informant will display the exact location of the thief but there will be a cash price involved. The “A” button is the arrest button. You can press this button to attempt an arrest. A successful arrest will have sirens and a shoot out, followed by a “hee-haw” siren noise. If you get a raspberry after the sirens, no luck, chuck. That’s a false arrest. If you are taunted by the thief (Na-na-na-na-na-na!) you have made an unsuccessful arrest. Each player takes one detective license. Each player chooses one a pawn. Shuffle the sleuth cards and deal three face-down cards to each player. The rest of the deck is placed face down on the board, creating the draw pile. Chose a detective to be the banker. Roll or vote. 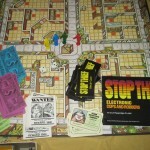 The banker shuffles the wanted posters and places them face down next to the bank. The banker then flips over the top wanted poster, puts the cash reward amount (listed on the poster) on top of the wanted poster and places it next to the board. The banker then passes out $300 to each detective. Every player rolls the dice, with the highest roll going first. Play continues clockwise. Begin your turn by pressing the “C” button once, roll the dice, and then move your playing piece in the direction you think the thief is located (based on the clue). You may then try to make an arrest, if you think you know the exact location of the thief. Sleuth Cards: You may play one sleuth card at any time during your turn. When you play a sleuth card, place it on the bottom of the draw pile, and draw a replacement card. The thief follows strict movement rules. It will only move at two times during play: 1) It might move when the “C” button is pressed, and 2) He will always move after an unsuccessful arrest. The thief can move in any direction: horizontally, vertically, or diagonally. He is limited to two spaces at a time, and he will only move from one numbered space to another. The thief will not move back and forth between a numbered space he has just left. Though the thief may eventually return to a space he was previously, there is a one turn cooling period between numbers. The thief can move to and through windows and doors. When the thief opens a door or a window (by breaking it of course), he will go through that door or window on his next move. The thief is fat and can’t climb walls. The thief can’t help himself from committing crimes. If he’s within one space of a crime location, he will commit the crime on his next move. When the thief commits a crime, that crime location is no longer a viable crime location until the thief leaves the building, and it will register on the scanner as floor space. The same is true of outdoor spaces, which will register as street spaces when they’ve been robbed. The same thief won’t rob the same outdoor space, but new thieves might rob it. When a thief reaches the numbered space in front of a subway, they will ride the subway on their next move. After riding the subway, the thief will surface at one of the five subway stations, possibly even the one he just entered. Regardless of his exit location, he will always exit onto the numbered space outside of the subway. When the thief escapes from the detectives after an unsuccessful arrest, he won’t stop moving until he is five or six numbered spaces away from them. Detectives move on every space, not only numbered spaces. You may move in any direction, and you may move up to the number of spaces you rolled. You do not have to move, nor do you have to move the full distance rolled. You simply may move up to that amount. If you want to move your full number rolled, and that space is occupied by another detective, move to any space adjacent to the occupied space. You are also fat, and can’t move over walls. You can go through doors but not windows. If you start your turn at a subway station, you may exit at any other station and move up to the limit of your roll. If you end at a subway station, you may move to any other subway station. If you moved to a subway station on your turn, you may ride the subway to any other station, but you cannot use the rest of your roll. You can attempt an arrest if you think you are on or directly next to the thief’s exact location. Attempt an arrest by pressing the “A” button. Enter the building number and location number, or the street number and location number. If you successfully arrested the thief, take the loot and the wanted poster. If it was unsuccessful, listen carefully to the sound clues as the thief runs away from the police. If you attempt an arrest at a location that does not contain the thief, you are guilty of a false arrest. You lose your detective license. End your turn, and on your next turn, if you have at least $100, pay the bank $100 to get your license back. If you have $50 only, pay the bank $50 to get your license back. If you have no money, you get your license back for free. When you get your license back, your turn ends. Resume play as normal on the turn following when you reacquired your license. For each failed arrest, the banker adds a $100 bounty to the thief’s wanted poster. You can cancel an arrest by pressing the arrest button again prior to entering all coordinates. You can’t cancel an arrest after you’ve entered the coordinates. Continue your turn as normal (you can even attempt an arrest). The winner is the first detective to earn $2500.